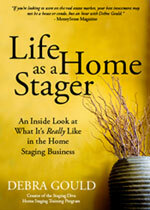 How Do You Choose Home Staging Colors? As a Home Stager, I’ve always been passionate about color, and doing color consultations has been an important part of my business since I started staging and redesigning client homes in 2002 with my home staging business Six Elements Inc. So far this winter, I’ve had a surprising number of projects from people who aren’t selling or moving and are just asking for help choosing the right colors for their home. I take you through two of my latest projects in this blog article, Color Consultations: A Behind the Scenes Look from Staging Diva. 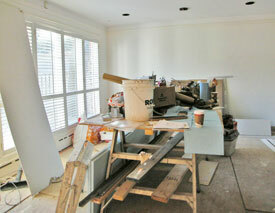 For this client, the workbench was actually the cleanest spot in the house which was being totally gutted and rebuilt. I had 2 hours to choose colors for this huge home, without the benefit of proper lighting or furniture to reference. In many cases, I didn’t even have a floor sample! Talk about a challenge. These were sub-optimal conditions for choosing colors, but it can be done. By the way, if you’re worried that you won’t be able to choose colors for your client because your own home has had swatches taped to the walls for months, you’re not alone! I asked my Facebook Friends and the consensus seems to be that we can choose colors much easier for clients than for ourselves. Isn’t that always the case? One of my Facebook Friends and Staging Diva Graduate Lois Ward of Goodlines (ON) said she lets her husband play the role of client so she can choose her own colors with less difficulty. And JoAnne Lenart-Weary suggested we all go on a field trip to do each other’s homes! That was a really fun suggestion.